This week's prompt is: Inspire - GO! Now, this week's word is "inspire". A coincidence? I think not. What inspires you? I have many things that inspire me, but music plays the biggest part of my inspiration. I listen to music to worship, to relax, to dance, sometimes to write, etc. Several years ago I had the privilege of going away for an entire weekend by myself to re-connect with God. It was led by My Father's Business and called the Ruach Journey. It was a time to get away, to breathe, ask the Lord what He sees in me and to tap into how God sees me. It was a time to realize how He made me; His Masterpiece. Ephesians 2:10 (AMP) For we are His workmanship [His own master work, a work of art], created in Christ "Jesus [reborn from above—spiritually transformed, renewed, ready to be used] for good works, which God prepared [for us] beforehand [taking paths which He set], so that we would walk in them [living the good life which He prearranged and made ready for us]." "But you are a chosen race, a royal priesthood, a consecrated nation, a [special] people for God’s own possession, so that you may proclaim the excellencies [the wonderful deeds and virtues and perfections] of Him who called you out of darkness into His marvelous light." I am a daughter of the King and a holy people, a royal priesthood! 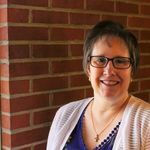 I saw myself differently and began afresh the journey to a deeper intimacy with Jesus! It was good to take a moment to remember, to think of other things and people who inspire me - family, friends, Scripture, the beauty of a rainbow, looking at God's creation, and hearing testimonies of God's work and faithfulness of those around me. Take a moment to listen to this piece, does it inspire you? What other things inspire you to be creative, "to produce; to fill or affect with a specified feeling, thought; to breathe, inhale"? 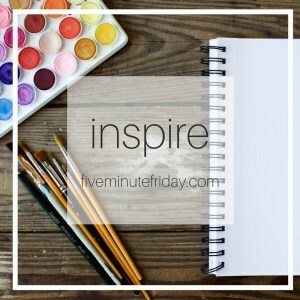 This post is part of Kate Motaung's "Five Minute Friday," which she hosts on the brand new Five Minute Friday website. Kate posts a single word each week and each blogger sets a timer for 5 minutes to write and then posts, with very little editing. This is an exercise in the discipline of writing. Check out this week's postings. Feel free to subscribe and share!